Tooth loss can happen for a variety of reasons, but it always produces the same devastating results. Not only is your oral health badly damaged, but your confidence as well, often making it difficult to talk and smile. There are several tooth replacement options, like dentures and bridges; however, they often leave patients wanting more. They want a solution that looks and feels like their natural teeth. Now, you can get your dream smile with the power of dental implants. Here at Annigan Dental, Dr. Henry Hsue and his team can help you through the implant process. The secret behind the success of dental implants is the fact that they replace both the root and crown. 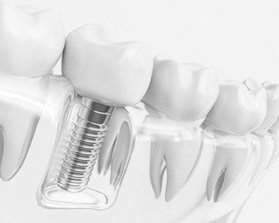 They replicate the root using a dental implant post, which is surgically placed into your jawbone. Although it remains hidden below your gum line, it is hard at work stimulating new bone growth to restore the density of your jaw. In addition, it fuses to your jawbone to create a secure and stable foundation for your replacement tooth. Dental implants can be used to treat all cases of tooth loss—no matter if you are missing one tooth, multiple teeth, or an entire arch. Depending on how many teeth are being replaced, your treatment process and the materials that are needed will vary slightly. An implant post is surgically placed into your jawbone. After adequate healing has occurred, an abutment is connected to the post to allow a custom-made dental crown to be attached. A bridge of prosthetic teeth is designed to match the appearance of your remaining natural teeth. Instead of using dental crowns to hold it in place, an average of one to two implant posts are used. A custom-made denture is made to replace your missing teeth. Prosthetic teeth are featured in a gum-colored base to provide a natural look. Instead of suction or an adhesive holding the denture in place, an average of 4 implant posts are used. 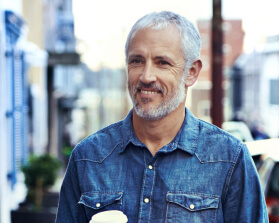 Dental implants do cost more upfront than traditional options; however, they offer a long-term investment. With the potential to last for a lifetime, they will eventually pay for themselves because you do not need to have them replaced. When determining how much you can expect to pay for your new smile, there is no set price tag. The amount you will pay is based on your individual treatment plan. Certain factors that influence the cost include the number of teeth being treated, the materials used, and if any additional procedures are needed. To help lower the cost, you may be able to use your dental coverage. Once an appropriate amount of time has passed for your new implants to gradually bond with your new jawbone and your gum tissue to heal, you’ll return to Annigan Dental so that we can design a brand-new, high-quality restoration that will attach to the implants, completing your new look. Single implants are replaced with all-ceramic crowns that have been precisely designed to complement your natural smile. In cases where several teeth or even an entire arch have been lost, a few implants can be strategically placed to anchor an implant-retained bridge or denture that offers much stronger function and natural look and feel when compared to traditional dentures and partial dentures. Tooth loss doesn’t have to be permanent; instead, enjoy the full, revitalized smile you deserve! Contact Annigan Dental today if you have any questions about our implant services, or if you’re ready to schedule an appointment. We know that you’ll enjoy spending time in our eco-friendly, modern office, and our comprehensive services provide exceptional quality at a reasonable value. Located in Bothell, WA, we also welcome new patients of all ages from the areas of Woodinville, Lake Forest Park, Kingsgate, Kenmore, and beyond. Tooth loss does not have to be permanent. You can enjoy a full, revitalized smile with Annigan Dental. Contact us today to schedule your consultation.